I'll cook some duck eggs over the weekend and report back to you. All I know about them now is that they are huge -- those puppies barely fit into a jumbo size pack! 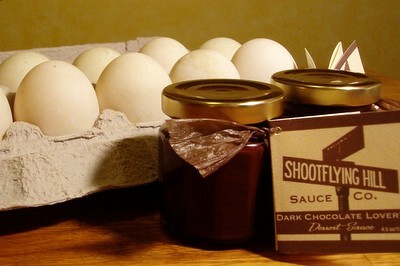 I was about to head out to pay Andrea for the eggs when I got an e-mail from Cory, the saucy CEO of Shootflying Hill Dessert Sauce Company. She also happens to be a technical writer in our office. She brought in two cute little jars of dark chocolate sauce that I asked her for. Nutella, watch out! Cory's stuff is really amazing. I've tried it on crepes, in tarts, and straight out of the jar with a large spoon. The only problem is that it's addictive and I try to keep the chocolate sauce jar hidden behind containers of OJ and mayo so that I am not tempted to indulge in it too often. I thought the little jars would make good Christmas presents, so that was my excuse for buying more. After stopping by Cory's office to get my sauce, and then by Andrea's office to pay her for the eggs, I had a warm and satisfying feeling of going food shopping. We just need to add a produce guy and a fishmonger to our staff of engineers, and I'll be all set with my food shopping. You'll love them! I tried some for the first time in China last year and fell off my chair (fortunatelly their chairs are quite short). The taste is a bit stronger then regular chicken eggs and they make an awesome omelet! We have about a dozen ducks who are quite productive. The one way I do not like duck eggs is boiled. They taste very dry that way. I think they may have a higher sulfur content or something. On the other hand they are wonderful in omelets, in baking and fabulous for meringues. Sadly, ducks do not lay year round, just in the late winter through the mid-summer so their eggs are a seasonal dish. Cool! The Word Verification word this time was "donop" which is almost a rotational palindrome! What a cool group of coworkers you have! I look forward to reading about your recipe with the duck eggs. I've never had them before.